SkillsServe 5.0 introduces a new 'Find Learning' User Interface as well as improved content management with the new pathway builder and diagnostic assessment features. 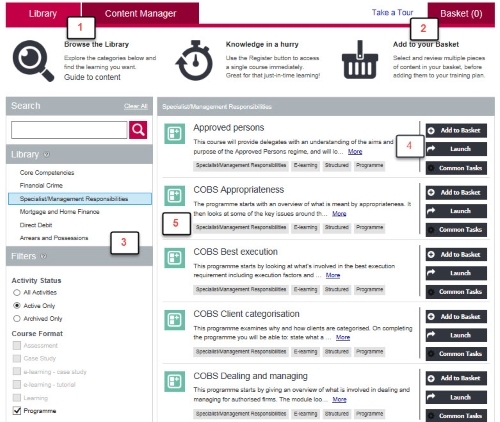 Benefits The 'Find Learning' catalogue area has been completely redesigned to provide a number of improvements, all developed to make it easier for users to search and register for activities and for administrators to manage and allocate content. 1. The 'Find Learning' and 'Content Manager' features are now combined. Those with the correct level of access can switch between the two features. 2. There is now a 'Basket' feature allowing users to select and add multiple learning activities to their training plan and enabling administrators to more quickly and easily create new pathways and add assessments. 3. The search and filter functionality has been improved, using similar principles as you would find within consumer shopping sites. 4. As well as adding content to a basket, there is also the option to launch the content directly. 5. Tags are now displayed beneath content, these assist with searching for and identifying content that is relevant. How to get this This functionality is currently being rolled out to CII Broker and Insurance Assess customers. It will be rolled out to ComplianceServe, SkillsServe and Financial Assess customers in in 2016. For more details, take a look at our Knowledge Base Guide. 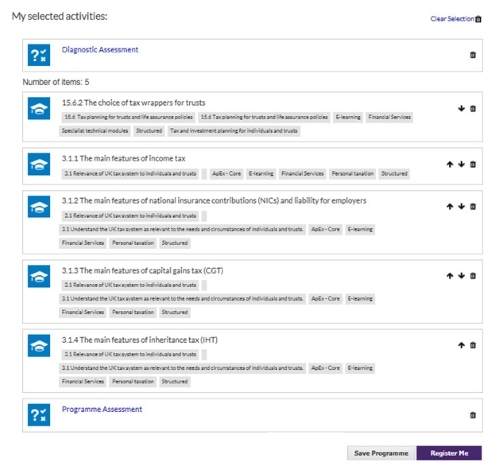 Benefits This feature allows administrators to create new learning pathways (formerly programmes) from the content that they add to their 'Basket' This considerably speeds up and simplifies the process of creating bespoke and relevant learning pathways from available content. How it works Browse through your learning catalogue and add each activity title to your basket. Once finished access your basket, finalise and re-order your selection before saving as a new learning pathway. Once you have clicked save you will be taken to the 'Common Tasks' area of your new learning pathway. How to get this This new feature will be rolled out in line with the Find Learning user interface. The Broker/Insurance Assess roll out is already in progress. ComplianceServe, SkillsServe and Financial Assess will follow in 2016. For more details, take a look at our Knowledge Base Guide. Benefits This feature allows administrators to automatically generate a diagnostic assessment based upon the content within a learning pathway. Users who successfully complete the diagnostic pre-assessment can be exempted from having to complete the content, thus saving time and increasing productivity whilst still ensuring users are maintaining relevant knowledge. How it works Content on SkillsServe can be mapped to question banks (whether provided as part of a subscription package such as ComplianceServe or Assess, or your organisation’s own). This allows for the creation of diagnostic assessments that test a user’s knowledge. If successful a user would be exempt from having to complete the related content. An end of learning pathway assessment can also be created automatically based upon the content and question mapping as well as results from the diagnostic assessment. How to get this This functionality is currently being rolled out in line with the Find Learning user interface and Pathway Builder to Broker/Insurance Assess customers. ComplianceServe, SkillsServe and Financial Assess will follow in 2016. For more details, take a look at our Knowledge Base Guide.